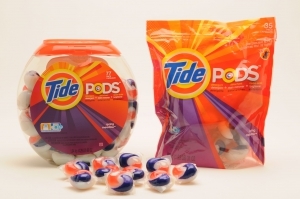 about Tide is: even though you are paying a lot to buy Tide, keep in mind how much detergent you use when you buy the cheap stuff! Every time I used it, I would have to almost double what I poured in my washer just to get my clothes clean. I will definitely stick with the more expensive detergent to make sure that my clothes come out clean and fresh. was something that big, I run a rinse cycle first to get the item wet and compress it down into the washer. Now when I do that, I can wash anything. likely, you won’t ever need more than one. I like that the scent lingers and my fabric still smell fresh days after they come out of the dryer. Another great thing is that they come in a variety of sizes - depending on how much laundry you do and how often. No doubt I recommend these to everyone. I’ve even got my family using them! They’re great!